The Seaside Architecture stamps and miniature sheet are issued on the occasion of the 500th anniversary of the founding of Trinity House, the body responsible for all UK lighthouses and lightships. (wikipedia, official site) The first pier in the UK was completed at Ryde on the Isle of Wight on 26 July 1814, so celebrating it's 200th anniversary tomorrow. The Eastbourne Bandstand 1st class stamp, with its brass band, includes the EUROPA logo, which is Royal Mail's nod to the Post-Europ 2014 theme of 'National music instruments'. The stamps and miniature sheet are designed by Why Not Associates using photography by Lee Mawdsley. The stamps are printed by ISP and the miniature sheet by Enschede. As well as the usual products there will be a coin cover to mark the Trinity House anniversary, the coin being a £2 commemorative. OK ... so which of these covers the 2014 Europa theme, which is "National Musical Instruments"? Thank you for the reminder, edit now made. A mark of its importance to Royal Mail is that no mention was of Europa was made in the information received, except as the location for the alternative postmark. If you look closely at the 1st Class Eastbourne Bandstand stamp, you can just make out a chap playing a Cornet. sigh..... I'm just looking at the Europa stamps on the contest page http://www.posteurop.org/StampContest and see such wonderful designs/instruments. Even the Faroese Symphony Orchestra looks more impressive than UK's "Europa" stamp (not issued in time for the competition). The music theme is more obvious on these, however. But at least you can vote for the Ukrainian entry (if you hadn't voted earlier). Why bother if you can give the right stamp, don't issue a stamp. Is Royal Mail now planning to do anything in connection with this issue to assist with the restoration o Eastbourne Pier. An overprinted donation amount on the Eastbourne stamp, perhaps? 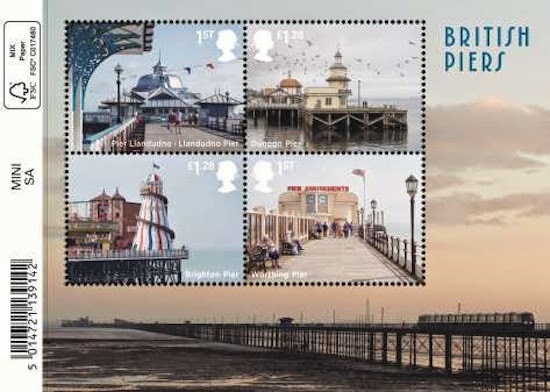 Brighton Pier (@BrightonPier) just tweeted a link to your blog regarding the new stamp! One of the best sets of the year for me, the pictures of the stamps are so focus and sharp and the stamps on the miniature capture the old vintage postcards from the era.